District Attorney Chansik Han (left) of Ulsan District Public Prosecutors Office and President Mooyoung Jung (right) of UNIST are posing for a portrait at the signing ceremony for cooperation MOU. Partnership to protect the rights for scientific and technological research achievements. UNIST has signed a memorandum of understanding (MOU) with the Ulsan District Prosecutor’s Office to establish bilateral cooperation activities in the field of Intellectual Property. Intellectural Property Rights (IPRs) are the rights given to people over the creations of their minds. It is a broad term that is used to cover patents, copyrights, and trademarks and is measured to promote innovation, investment in science and technology for the public welfare. They usually give the creator an exclusive right over the use of his or her creation for a certain period of time. The goal of IP protection is to safeguard rights holders to compete in markets. UNIST strives to advance its outstanding research results into overseas markets. However, due to an increase in IPR infringement claims, there is a growing concern in the protection of the IPRs. UNIST and Ulsan District Public Prosecutors Office have signed a Memorandum of Understanding, creating partnership to protect the rights for scientific and technological research achievements. In the memorandum of understanding, the two organizations promised to formulate policies on science and technology and protect by law achievements in scientific and technological research, patents, discoveries and inventions. 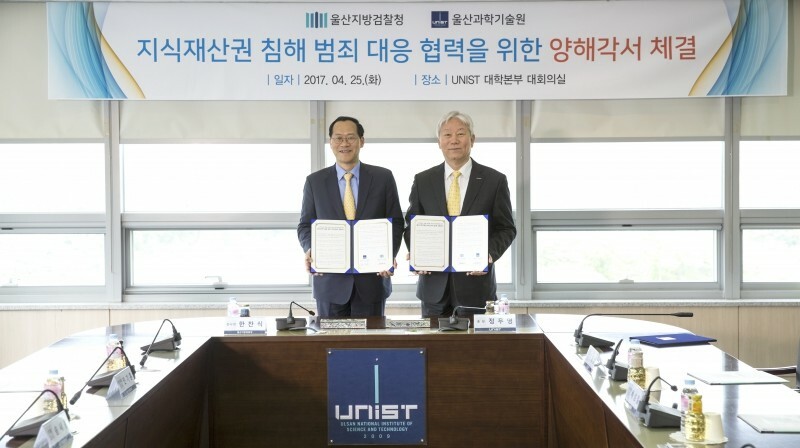 Under this partnership, Ulsan District Public Prosecutors’ Office will help protect UNIST’s IPRs and provide legal advice regarding the protection of research achievements. “We would like to help UNIST concentrate solely on research without worrying about IP infringement,” says District Attorney Chansik Han of Ulsan District Public Prosecutor’s Office. 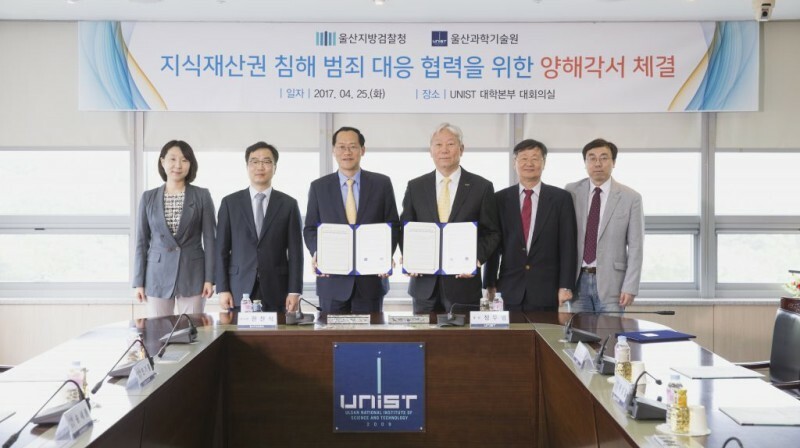 With the support of Ulsan City, UNIST has been fostering its research brands with a focus on the possibility of creating a new growth engine of the nation and the city. Starting with the lithium secondary battery, it plans to expand its research brands, including seawater batteries, treatment for dementia, and the production of biodiesel, using carbon dioxide.